Our trip began on November 5, 2009. Our group consisted of two attendings, two residents and four medical students from the VA/DC/MD area. Each day, we left our hostel at 8:00 am and headed in our packed minivan to the local community, Paraiso. It is a barrio located about 45 minutes from the capital of the Dominican Republic, Santo Domingo. After arriving at the local elementary school, we set up our clinic. It was overwhelming at first to be greeted by about 50 locals lined up waiting to see the doctor. But that was only half the group, as a total of 100 tickets were distributed by the school principal each day. We split up into three different rooms: triage, consult, and pharmacy. 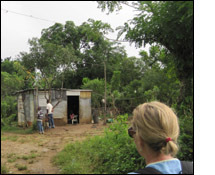 In addition, each day two members and a local guide headed for home visits to Esfuerzo, the impoverished section of Paraiso. We soon came face to face with the small, poorly ventilated homes that suffered from continual flood damage. We offered medical care and prescription medications to those that were too ill, or physically unable to make the trip to the clinic. We also conducted health surveys about diarrhea, water supply and parasites to gather information about the root causes of poor health in this neighborhood. Some residents had access to local physicians in the past but could not afford the prescribed medication or did not follow up as instructed. As a result, we saw many untreated or inadequately treated chronic medical problems, including high blood pressure, diabetes and asthma. We also diagnosed and treated many dermatological conditions in the pediatric population, including various fungal infections. This community exists in a setting where death from infections, including intestinal parasites, is prevalent. Therefore, we provided all eligible patients with anti-parasite medication which will provide them protection for up to 6 months. It became clear that a lack of access to consistent medical care is a larger problem than we could solve in our two weeks. In the mean time, we did our best to provide medical services to those in need and counsel locals on ways to improve their health. This was my first international medical service trip and I found it to be very exciting, educational and rewarding. I would like the thank The Benjamin H. Josephson, MD Fund for this amazing opportunity. I plan to continue to participate in other global health projects once I complete my family medicine residency in June 2011!